This report covers the major amino acids used in animal feed throughout the world. Although the report discusses nonfeed uses, the main focus is on animal feed use. Lysine, methionine, threonine, and tryptophan are the four major amino acids used in poultry and swine diets. Lysine and methionine are both very large markets; threonine and tryptophan, although smaller markets, are higher-growth markets. The lysine market is almost twice the size of the methionine market, with methionine being almost five times the size of the threonine market. The market for tryptophan is significantly smaller. Amino acid production is highly concentrated, with the top five producers dominating 70% of the market share for each of the product categories. Key market participants include Evonik, CJ CheilJedang, Ajinomoto, Jilin Dacheng, Hebei Meihua, Adisseo, and Novus. There has been rapid capacity expansion in the past five years, driven by strong demand from poultry and swine production. Although the report discusses nonfeed uses, the main focus is on animal feed use. Lysine and methionine are the dominant amino acids used in animal feed, and recently, threonine and tryptophan (albeit at much lower volumes) have experienced high growth in animal feed use as a result of improved efficiency and reduced waste. The lysine market is almost twice the size of the methionine market, with methionine being more than 2.5 times the size of the threonine market. The market for tryptophan is significantly smaller. The following pie charts show world consumption of the four major amino acids. 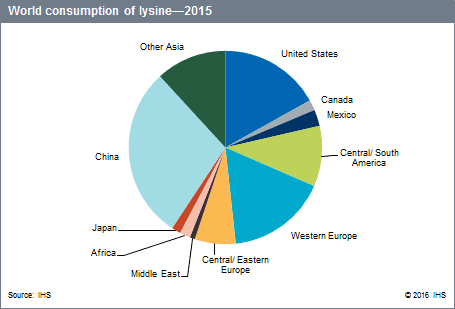 Lysine consumption has jumped globally since 2010 (the only exception being Western Europe), as higher concentrations of lysine are used in animal diets. Production and consumption are concentrated in China (over 50% of capacity and over 25% of consumption), followed by the United States (15–20% of capacity and consumption). Both countries are the major exporters, with Other Asia emerging as a new seller after rapid capacity additions in the last few years. Healthy growth of over 4% per year is expected for the major lysine consuming regions. 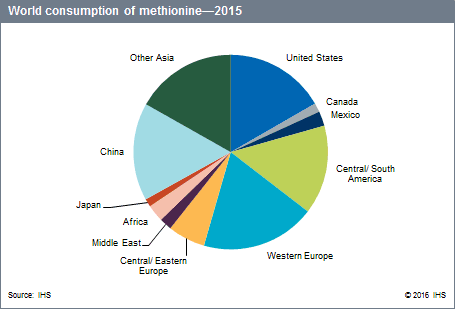 Methionine consumption has entered a mature stage in developed countries, with new growth coming from developing countries. Methionine is consumed widely in the United States, Central and South America, Western Europe, China, and Other Asia, with each region taking a similar share of 15–20%. Western Europe and the United States are the major methionine producers and exporters. Consumption growth will continue at over 3% per year, driven by China, Other Asia, Central and South America, and Central and Eastern Europe. Threonine and tryptophan markets are growing strongly as animal nutrition knowledge drives demand higher on a global basis. 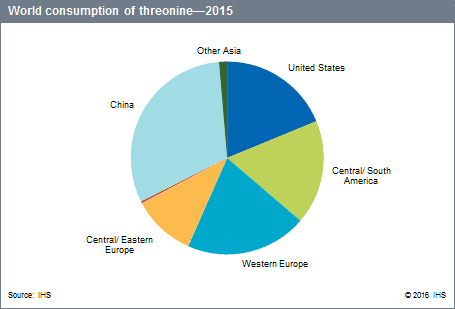 Threonine production is dominated by China, with over 70% of global capacity. China is also the leading consumer (over 30% of global demand), followed by Western Europe (20%), the United States (19%), and Central and South America (17%). Robust growth of over 6% is expected over the next five years, with all regions growing at similar rates on the back of higher concentrations of threonine supplementation in animal diets. 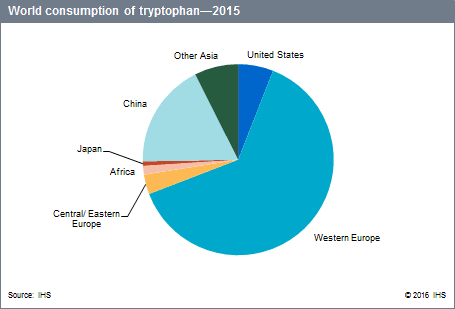 Tryptophan is consumed primarily in Western Europe (over 60% of consumption) and demand is met by imports from China. Similar to threonine, China tops tryptophan capacity, with over 50% of the global share. Most Chinese tryptophan production is for export markets. Strong consumption growth of over 10% per year is expected for tryptophan, driven by Western Europe, China, Other Asia, and the United States.